Are you a bit obsessed like I am with calendars? I just can’t have too many of them and purchase one for every room. So it only made sense to start making my own to save a little money. 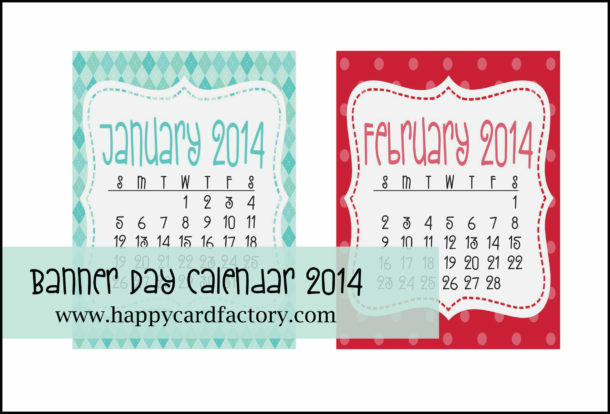 I am finally finished with my printable 2014 calendar and am sharing it with you. Since these were made in 3″ x 4″ size, I am hanging it (with the help of Trendy Twine) on the wall above my monitor because it won’t take up a lot of wall space. That is after it becomes a tearpad. There are just so many uses for this set. 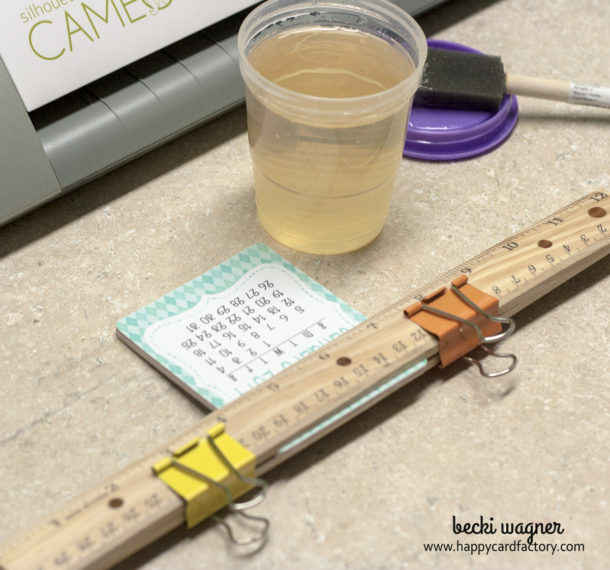 They can be make into a desktop calendar with an easel back like I did for last year’s Advent calendar, Project Life, magnet for the fridge, and even printed out with printable adhesive fabric and placed in an grouping in your child’s room or office. Just about anywhere. Oh, I almost forget, these would make great stocking stuffers! I am going to print a bunch out and give them to the ladies at church. In the download, there is a PDF and Silhouette Studio file. If you have a Cameo, it makes it super quick to whip up a bunch of these without having to get hand cramps. 🙂 Get the free calendar by visiting my store – HCF Party Printables. Sorry, the Banner Day calendar is no longer available. I do have a few planner printables and calendars available for you if you still want to check out the store. Also, be on the lookout for a new 2015 calendar that is similar to this one! The Studio and MTC version are both ready for PnC. Email me at the contact me button above and I will send you the MTC file. Thanks for stopping by! Sent! Let me know if there are any problems with it. Thanks again! This is awesome Becki, thanks so much for sharing!! Thanks, Brigit. I appreciate you stopping by and you’re very welcome! I just got a Silhouette Cameo for Christmas and I’m new to using it. I was delighted to find your calendar already done in the proper format and it’s darling. One issue that I’m having is I don’t know how to move to the next page. I’ve print and cut the first page, but can’t move to the 2nd or 3rd pages. I’ve tried to find my answer online and in the manual, but no luck. Thanks for any advice you can give me. I’m excited to finish my calendar. Hi Laura, they are not pages per say. I just double checked how I laid out the calender in Studio. If you notice only the first four months are on the mat and the others are off to the side. That is because Studio will not cut what is not on the mat, I put the ones that didn’t fit to the side. So what you need to do is move off the first set to the side or delete them temporarily. Then highlight the next set of 4 months, move them on to the mat. I would just be careful with how I have them as they fit perfectly on the mat in the arrangement they are in. If you have any other questions, let me know. Adorable little calendar! 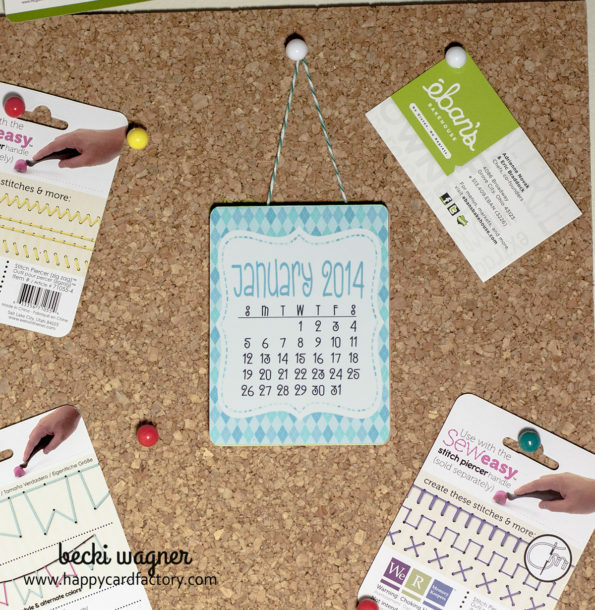 I really like how you put in in the center of the corkboard so you can pin other date sensitive things around the calendar! Thanks for the free download! You’re welcome! Glad you could stop by, Brittany. Thank you so much for sharing this! 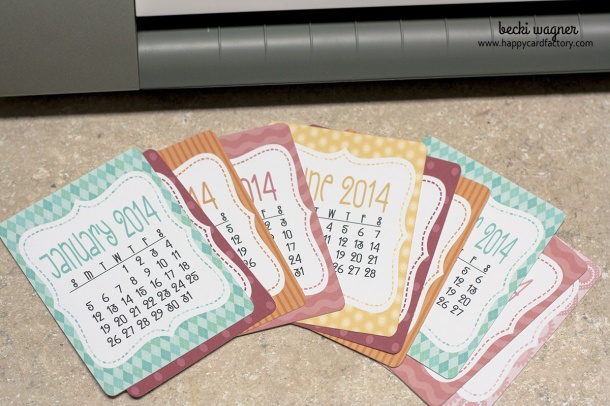 I’ve been looking for a little calendar like this and yours is adorable! You’re welcome, Julie! Thanks for stopping by.